0% Financing Available. Call to ask for more information on our 0% Financing Payment Plan. Call our FREE customer service support with any Brother PR-655 Embroidery Machine questions. The Brother PR-655 Embroidery Machine is the first step in expanding your at home business. 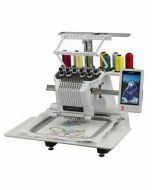 Buy the Brother PR-655 Embroidery Machine from Ken's Sewing Center and receive FREE how to training in our retail store. Buying from us guarantees a hassle free shopping experience. The Brother PR-655 Embroidery Machine can only be purchased in the retail store.